Over the years, engineers have found ways to cram more and more transistors onto a single integrated circuit. As a result of these improvements, they have been able to pack more computing power into smaller machines. In much the same way, the key to developing better high-energy particle accelerators has been building increasingly powerful magnets to put inside them. 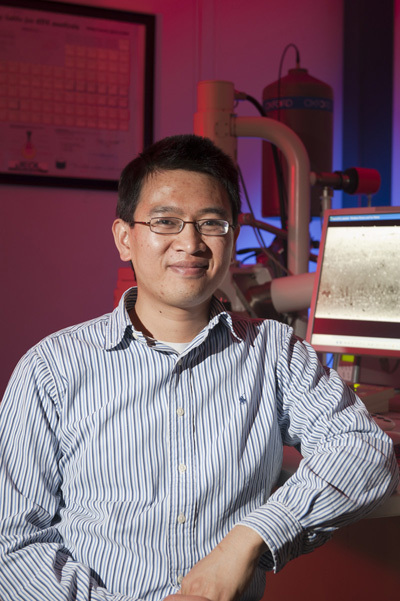 The Department of Energy recently presented an Early Career Research Award to Fermilab scientist Tengming Shen, a 2010 Peoples Fellow working to spur the next magnet revolution. DOE awarded Shen $500,000 per year for five years for his research into engineering high-field superconducting materials for advanced accelerator technology. If his team succeeds, the work could pave the way for the construction of high-field superconducting magnets for future accelerators such as Fermilab's proposed muon collider, for energy upgrades of the Large Hadron Collider and for the development of new medical imaging devices. Shen's strategy is to search for a better magnet-making material. Scientists currently use two niobium-based materials, NbTi and Nb3Sn. "You have to go into a territory that's new," he said. Shen works with superconducting magnets, which conduct electricity without resistance when cooled below a certain temperature. This reduces the amount of energy required to power them and allows them to achieve higher magnetic fields. To reach this point in his research, Shen has collaborated with other scientists in the Very High Field Superconducting Magnet Collaboration, a partnership among U.S. national laboratories, universities and members of superconductor industry. Fermilab's Tevatron was the first particle accelerator to use niobium-titanium superconducting magnets. Before superconducting magnets, scientists had used iron or copper magnets, which required large amounts of electricity and, when used with insufficient cooling, tended to melt. Fermilab founder Bob Wilson purchased as much niobium-titanium as he could, and Fermilab scientists developed a process for building large superconducting magnets. Members of industry eventually adopted the technology to mass-produce magnets used in MRI machines, now found in most hospitals. The major particle accelerators that have followed – the LHC at CERN, HERA at DESY and RHIC at Brookhaven National Laboratory – all depend on this technology. Earlier this month, colloquium speaker Bob Tschirhart presented former Fermilab Director Leon Lederman with a toy lightsaber in recognition of his receiving the 2012 Vannevar Bush award. In his talk, Tschirhart described Bush's role in establishing the national laboratories in the United States and summarized Lederman's achievements in research and science education. Tschirhart went on to explain how the proposed Project X at Fermilab would continue the legacies of Bush and Lederman. View the streaming video of Tschirhart's colloquium. At 18:24, Tschirhart discusses Lederman's achievements and the 2012 Vannevar Bush award. 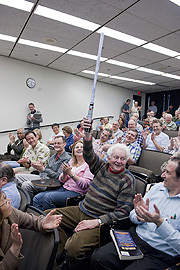 At 1:01:10, he presents Lederman with the lightsaber. When three American astronomers won the Nobel Prize in Physics last year, for discovering that the expansion of the universe was speeding up in defiance of cosmic gravity — as if change fell out of your pockets onto the ceiling — it reaffirmed dark energy, the glibly named culprit behind this behavior, as the great cosmic surprise and mystery of our time. And it underscored the case, long urged by American astronomers, for a NASA mission to measure dark energy — to determine, for example, whether the cosmos would expand forever or whether, perhaps, there might be something wrong with our understanding of gravity. In 2019, a spacecraft known as Euclid will begin such a mission to study dark energy. But it is being launched by the European Space Agency, not NASA, with American astronomers serving only as very junior partners, contributing $20 million and some infrared sensors. Last week I attended the inauguration of SNOLAB. This underground facility in Ontario, Canada has been used now for more than two decades, starting with the enormously successful Sudbury Neutrino Observatory. SNO was a daring experiment that borrowed several hundred tons of extremely valuable heavy water from the Canadian nuclear establishment and resulted in the most precise understanding of neutrinos from the sun. Over the years additional experiments joined SNO to take advantage of the deep underground location. In the last few years the underground facilities have been expanded with several large caverns and experiments, resulting in the world's deepest, largest clean-area laboratory. We at Fermilab have several dark-matter experiments either running or planned to be located at SNOLAB. The COUPP 4-kilogram bubble chamber has been operating for more than a year. We will commission the next device, a 60-kilogram chamber, later this year. Assuming all goes well with the 60-kilogram chamber, we are planning for a 500-kilogram chamber. The Cryogenic Dark Matter Search (CDMS), currently running with 10 kilograms of germanium detectors in the Soudan mine in Minnesota, is seeking support from the DOE and NSF to install 100 kilograms of cryogenic germanium detectors at SNOLAB. CDMS will also compete with other dark-matter proposals in the Generation 2 (G2) funding competition next year. We will soon move the DAMIC prototype detector to SNOLAB. DAMIC uses very low-noise CCDs to detect dark-matter particles with a very low threshold, which makes it sensitive to much lighter dark-matter particles than other current experimental technologies. Visiting SNOLAB is an interesting and unusual experience. To reach the lab, you shoot down the lift some 6,800 feet into the earth, walk through a mile-long drift that is part of a working nickel mine on muddy, uneven ground, and then arrive in the ultra-clean facilities at the laboratory itself. You enter the lab after leaving your clothes behind, taking a shower and donning clean Tyvek suits. Over the years, SNOLAB has developed much experience in keeping out any materials that could bring low-level radioactive backgrounds into the laboratory. A special feature of SNOLAB is the remarkable collaboration between public and private entities. 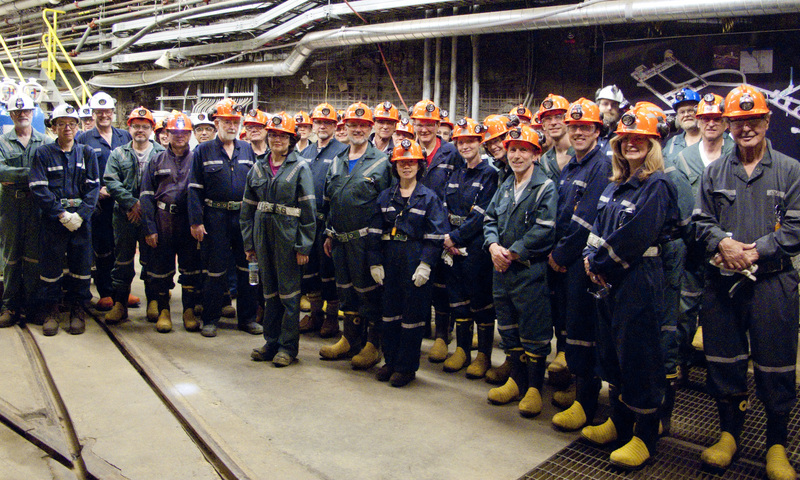 Support for the laboratory comes from the Canadian federal government, the Ontario provincial government and the Vale Company that owns the mine. It is impressive to see what this collaboration has achieved over time. Perseverance and great physics results do pay off! This summer Fermilab's Diversity Council is introducing a lecture series and site tours specifically for laboratory employees. The lecture series, titled "At Work Behind the Scenes," kicks off tomorrow at noon in One West with a talk by Nancy Grossman on the Environmental Health & Safety Section. Lectures in this new series will be given every other month. The employee site tours give staff a chance to see areas of the laboratory and grounds they don't usually visit during their day-to-day work. The tours begin in June and include a visit to the Main Control Room and a prairie tour. For more information, email Sandra Charles at scharles@fnal.gov or John Kent at jwkent@fnal.gov.